This post contains discussions about “punctuation.” Consider yourself warned ;). I’ve always wanted to get into trying cloth menstrual pads. I looked into it from major retailers but YIKES! Have you seen the prices on them? Seeing as I’ve had 6 periods in 5 years (I love being pregnant & nursing), I’ve never bothered with the investment. I have noticed one thing that is very different since I gave birth though. I may not have a period but my daily discharges are much heavier and quickly make my undies look pretty sorry unless I take measures to protect them. A better pantyliner solution was needed. I recently discovered MotherMoon Pads. Denelle makes all her own pads, including pantyliners. You can get a variety of fabrics, lengths & styles to find what works best for you. I was really impressed with several things about MotherMoon Pads. First, they were VERY soft. Second, they were very well made. And third, they were better than I had hoped in many ways. I thought they would give me wedgies, but they were a better than the disposable kind. They didn’t spin around and on the occasions that they did shift, at least no hair was pulled :). I also thought they might be annoying due to their thickness; they weren’t. I completely forgot they were there. And lastly, I thought they would be hot. I wore the MotherMoon pads during the hottest weeks of summer and I was actually drier! The only con for me was that I didn’t like the wingless style. I often lost it when I used the ahem…facilities. With little kids I often only have one hand available and you need two hands to properly put it back on. Additionally, I would stick with the normal length. I love long pads but the 10″ is a bit too long, even for me. You can buy MotherMoon pads at her HyenaCart storefront. I really like the 8″ The Owl Collection pantyliner. It’s cute and functional. My friend and I were actually talking about these the other day. She moved to England and this is all they use. They dont have disposable like us. She told me to look into them and they do save loads of money. I am most interested in Ultimate Overnight Pad. I find I have a heavy flow 2 of the 5 days. Also, the most trouble at night time. As a woman that has embarrassing HEAVY flows, I appreciate you hosting a giveaway like this. I love how she adds the snaps so they stay in place. I am interested in the 10″ Heavy Flow Pads. I am interested in the Ultimate Overnight pads. I would like to try the 12″ Heavy Flow Pads. I am interested in the green pantiliners!! 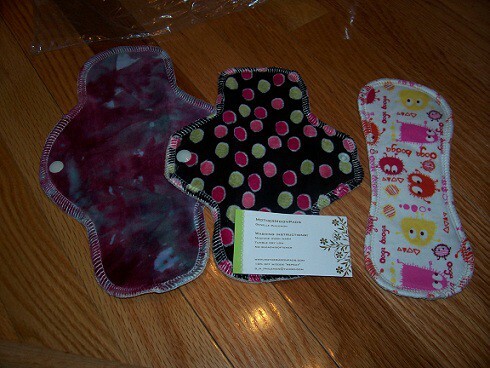 I love the 8″ pantyliner from The Owl Collection! I like the shape of the Ultinate pads. I’m also intrigued by velour pantyliners. I would like to try the 10″ normal flow pads! I am very interested in the Ultimate Overnight pads that are available. The FFS 10″ heavy flow mama cloth from *The Minky Owl Collection* looks very nice!